The annual tour of historic Pohatcong will take place on October 17th. Trips leave at 11 am ( returning at 3:15) and,if there is demand, 12:30 (returning at 4:45). 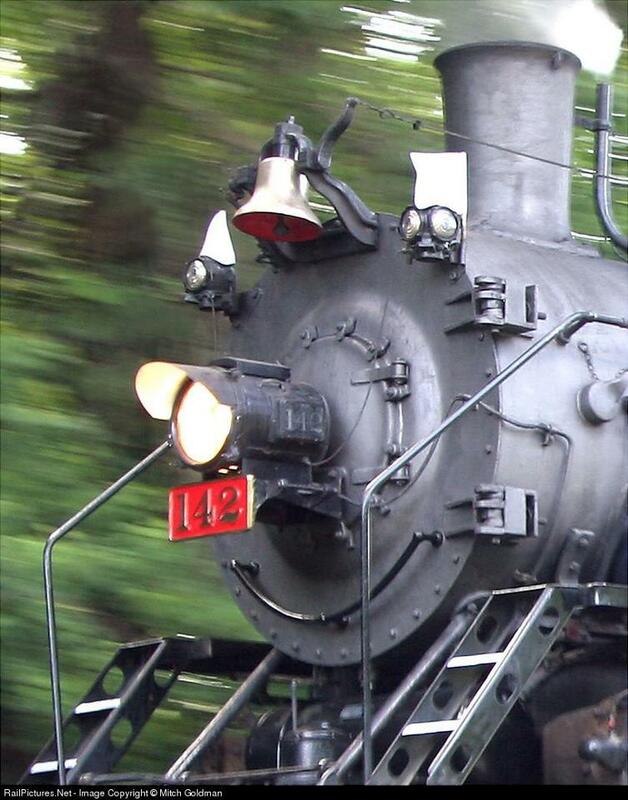 Ride back in time on the Delaware River Railroad Excursions behind steam locomotive #142. 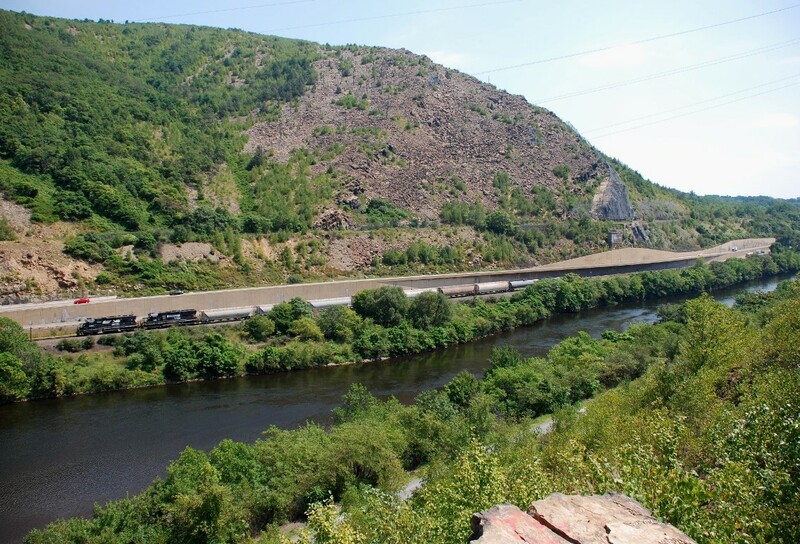 The train will take you to just North of "Pinchers Point" along the Delaware where you will board a bus on a docent guided tour of three beautiful historic houses. You will receive an informative brochure with plenty of information about the houses. 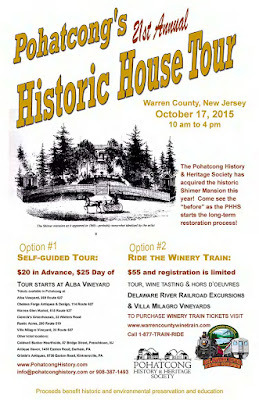 After the house tour the bus will take you to Villa Milagro Vineyards for Hors D'orvres and wine tasting, then back to the steam train for your homeward bound trip to Phillipsburg. Click on flyer below to see it enlarged, then use your browser's BACK button to return here. KINGSPORT, Tenn. - Rising pop star and "The Voice" Season 8 runner-up Meghan Linsey will be the celebrity guest on the Santa Train when it makes its 73rd journey to bring gifts to Appalachian families on Saturday, Nov. 21. She will accompany Santa and event sponsors CSX, Dignity U Wear, Food City and the Kingsport Chamber of Commerce on the 110-mile trek. Fans can use the hashtag #santatrain15 to engage in the Santa Train conversation on social media. "I'm honored to be the celebrity guest on this year's Santa Train," Linsey said. "This is a wonderful opportunity to give back and be a part of something that has become a holiday tradition for many families, and I am looking forward to being a part of it." 2015 has been a big year for Linsey, who released her EP titled "Believer" in July. The six-song EP highlights her crossover from country music to pop and debuted at No. 6 on the iTunes pop chart. "We are so glad to have Meghan Linsey join us on this year's Santa Train," said Tori Kaplan, assistant vice president, corporate social responsibility for CSX. "We are thankful for the support we receive each year from our celebrity guests. It's humbling to see artists add to the holiday cheer the Santa Train brings to the region." Prior to her appearance on "The Voice," Linsey was half of the country duo Steel Magnolia, which dominated top charts in 2009. Linsey has had three Top 5 songs on the iTunes all-genre chart, including "Change My Mind," which she performed as an original song on "The Voice" finale. The Santa Train makes 14 stops in Kentucky, Virginia and Tennessee and delivers toys, food and winter clothing to hundreds of children and families along the way. Photos and video of Meghan Linsey are available now, and photos and video from this year's Santa Train will be available Monday, Nov. 23. Email Richel Albright at ralbright@mpf.com if you are interested in using the images. Now in its 73rd year, the Santa Train runs along a 110-mile route through Appalachia, making 14 stops in Kentucky, Virginia and Tennessee to distribute more than 15 tons of toys to Appalachian families. The Santa Train is sponsored by CSX, Dignity U Wear, Food City and the Kingsport Chamber of Commerce. Please visit http://www.beyondourrails.org/events/santa-train for more information. For updates about the #SantaTrain15, follow along on Facebook, Twitter, YouTube, Pinterest and Instagram. Meghan Linsey is taking the nation by storm with her powerful, soulful voice. Growing up in the melting pot of music that is New Orleans, Linsey credits her distinctive sound to the artists she grew up listening to - Etta James, Aretha Franklin, Whitney Houston, Dolly Parton and Tanya Tucker, to name a few. At the age of 14, Linsey started playing shows with her own band, and a year later she was opening for acts like Brad Paisley and Blake Shelton. Since her success on "The Voice," she has released her debut EP, "Believer," which hit No. 7 on the iTunes pop chart. Please visit meghanlinsey.com for more information. Freight through the Lehigh Gap; 1985 and 2015! While contemplating where to photograph NKP 765's Saturday excursion, I thought that just before it enters Palmerton that the Lehigh Gap would be a good location. The next question would be what side of the Lehigh River would be better. As it turned out shooting from the river's east side gave me the image I hoped for. Still I was curious as to what a image taken on the west side would have looked like. Back on September 22, 1985 I was fortunate to photograph a northbound D&H freight. In the lead was B&M 331, followed by B&M 324 and D&H 7324 (ex-LV 324) traveling over the former CNJ tracks. 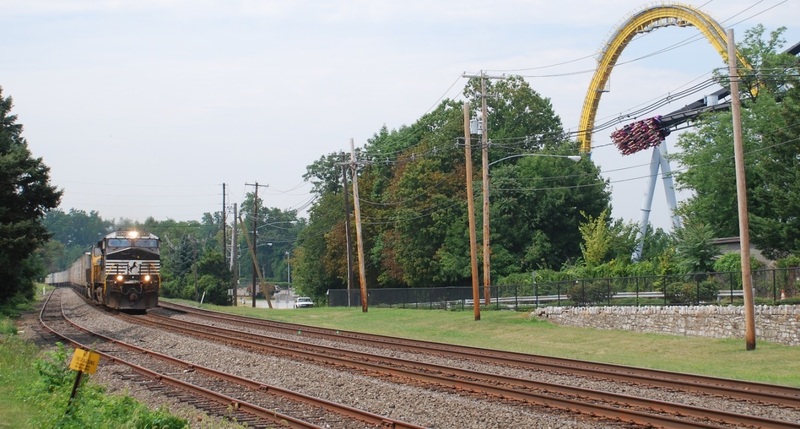 The LVRR tracks are in the foreground.Fast forward to August 24, 2015 when a northbound NS local made its way north. NS 5664 and NS 4619 have seven ACF and two tank cars in tow as they pass through the gap with some of the cars obscured by the tree's foliage. That gray trail seen through the foliage in the foreground is the former LVRR tracks now converted to a bicycle path. Makes me glad I went with my original choice! NORFOLK, Va., Aug. 20, 2015 – Norfolk Southern Corporation (NYSE: NSC) Executive Vice President and Chief Marketing Officer Alan H. Shaw will make a presentation at the Cowen and Company 8th Annual Global Transportation Conference. Where: Boston Harbor Hotel, Boston, Mass. How is the view from up there? NS 9936 and an unidentified UP diesel form the power consist for an eastbound Roadrailer train, perhaps 242 or 244, past Hershey Park on Tuesday morning as it makes its way to Bethlehem, Pennsylvania. Off to the train's right can be seen some riders on a floorless roller coaster almost parallel to the ground below. That had me wondering as to what the view was from up there? Despite having to deal with some nasty gnats while waiting for the Erie heritage led 24Z, it was worth the wait. Prior to 24Z's arrival at LEHL MP 40 (Valley Road grade crossing in Hillsborough, NJ) at 9:14, there was NS 18G with NS 2671 and CP 9806 @ 8:01 and NS 22V @ 8:45 with NS 6770 and NS 7580 providing the motive power. Not a bad way to spend part of this morning. Due to the upcoming visit of Pope Francis, September 22nd - September 28th in the Philadelphia, New Jersey, and New York City area Norfolk Southern is anticipating some service interruptions. There will be train movement restrictions placed on CSX, NS, and Conrail, in addition to various road and bridge closures which may impact the ability to move trains or position crews and employees. The Conrail Movement Office will be manned 24 hours per day. Conrail and Norfolk Southern will maintain scheduled service where possible and prioritize traffic accordingly. We ask that all customers in these areas prepare for the possibility of service interruptions during this time. Norfolk Southern appreciates the cooperation of our customers during this very special, significant lifetime event. Customers with questions regarding local service in the Conrail area should contact their Conrail Customer Service Representative. 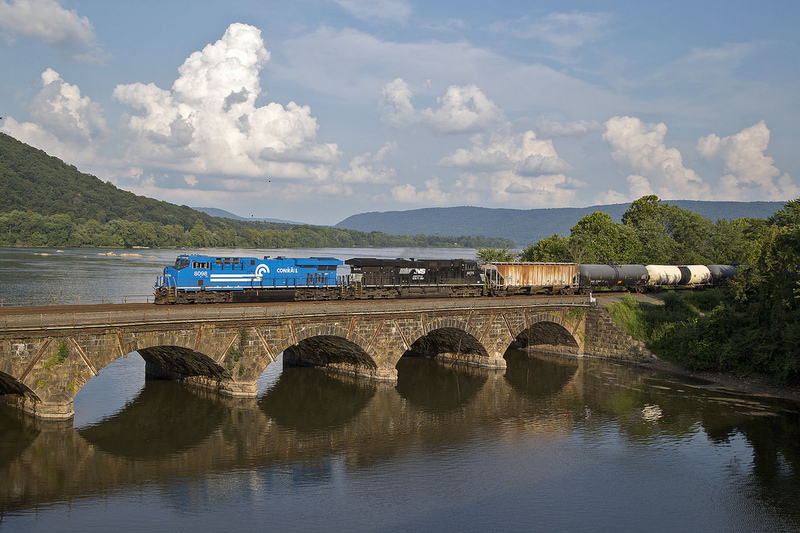 Conrail Customer Service at 800-456-3018. For the last road trip of this year, my wife and I decided to drive to Jamestown, NY in order to visit the Lucille Ball Museum. This was the town that she was born in and would reside in for a time before striking it big in the entertainment field. I didn't anticipate seeing much railroad activity during the course of our travels but did manage to find these reminders of an area that once had a rich railroading heritage. 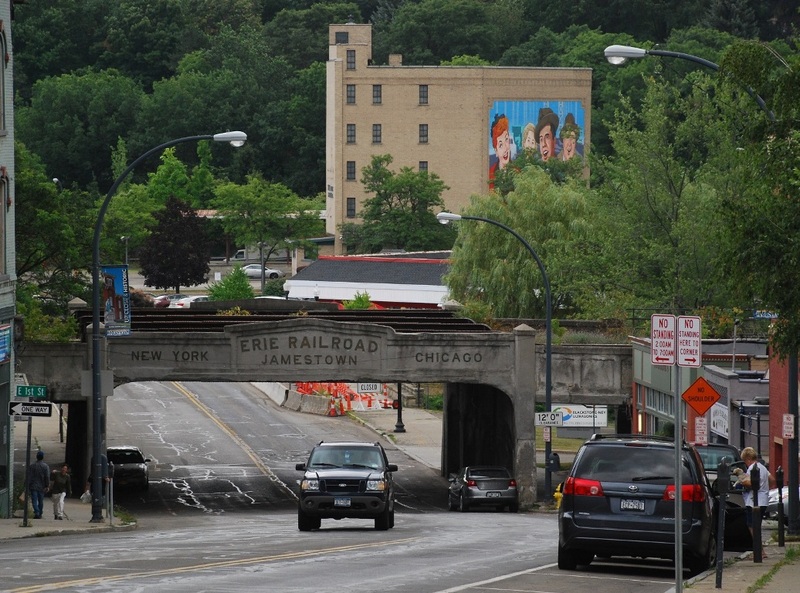 Photo 1: The Erie Railroad Bridge in Jamestown passes over Main Street. Off to the right and in the background can be seen a mural of Lucille Ball, Desi Arnaz, Vivian Vance and William Frawley on the building as a tribute. Vance and Frawley played Lucy and Ricky's neighbors when they lived in NYC on the television series. Photos 2 and 3: Built by the Erie Railroad, date unknown, this depot is now privately owned. It also serves as home to the Buffalo Southern RR. Off to the right can be seen a green transfer caboose on the siding. That would be Penn Central transfer caboose 18216. After taking Main 1 (former Royce Runner) at 2:25 to hold for two NS eastbound intermodals, NS H76 (Allentown to Hillsborough) prepares to work the Aeropres siding at 3:37 on Friday afternoon. 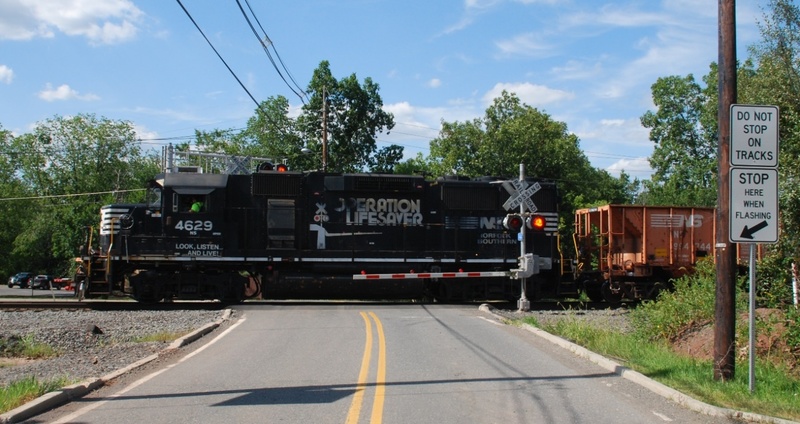 As it passes through the Valley Road grade crossing (LEHL MP 40) in Hillsborough, NJ motorists see a subtle reminder to "LOOK, LISTEN AND LIVE" on NS 4629's (EMD GP59) cab when they approach any grade crossing. H76's consist prior to working Aeropres would be one boxcar, three tank cars and two hoppers. NORFOLK, Va., Aug. 4, 2015 – Deborah H. Butler, executive vice president planning and chief information officer of Norfolk Southern Corp. (NYSE: NSC), has announced her intention to retire effective Oct. 1, 2015, President and CEO Jim Squires said today. Butler joined Norfolk Southern in 1978 as a customer account auditor. She served in positions of increasing responsibility in operations before being named assistant vice president transportation customer services in 2000 and vice president customer service in 2002. She has served as chairman of the board of Thoroughbred Technology and Telecommunications LLC, an NS subsidiary, and as a board member of TTX Company Inc., which provides railcars and related freight car management services to the rail industry. From the lens of Brian Plant. Relentless in his pursuit, he is now twenty-for-twenty NS Heritage fleet units leading trains. 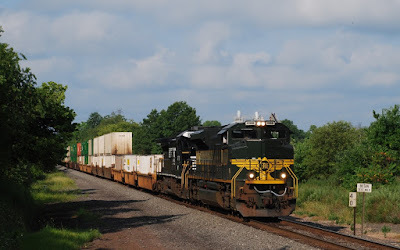 I finally got all twenty Norfolk Southern heritage units when I followed empty oil train 65V west of Harrisburg last night. It sure has been a fun journey and I can thank many of you on this email list for helping me reach my goal of catching all 20 units in the wild leading trains. 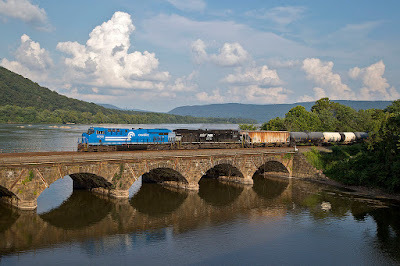 NS 8098 West crosses Sherman's Creek viaduct with the Susquehanna River in the background at Duncannon, Pennsylvania. NORFOLK, Va., Aug. 3, 2015 – Norfolk Southern’s Whistle-Stop Safety Train continues its journey this week, traveling through Ohio Aug. 4-6 to deliver a life-saving message to motorists and pedestrians about staying safe around railroad tracks. The safety train, a partnership between Norfolk Southern and Operation Lifesaver, a national rail safety public education organization, will stop in Cincinnati, Dayton, Columbus, Bellevue, Cleveland, and Alliance. The train last week traveled through South Carolina and North Carolina. Last year, 267 people died in the U.S. in highway-rail grade crossing incidents, an increase of 16 percent compared with 2013, and deaths due to trespassing on train tracks jumped 22 percent to 526 people, according to Federal Railroad Administration statistics. Ohio had the eighth highest number of grade crossing collisions in the nation last year with 86, compared with 71 the year before. 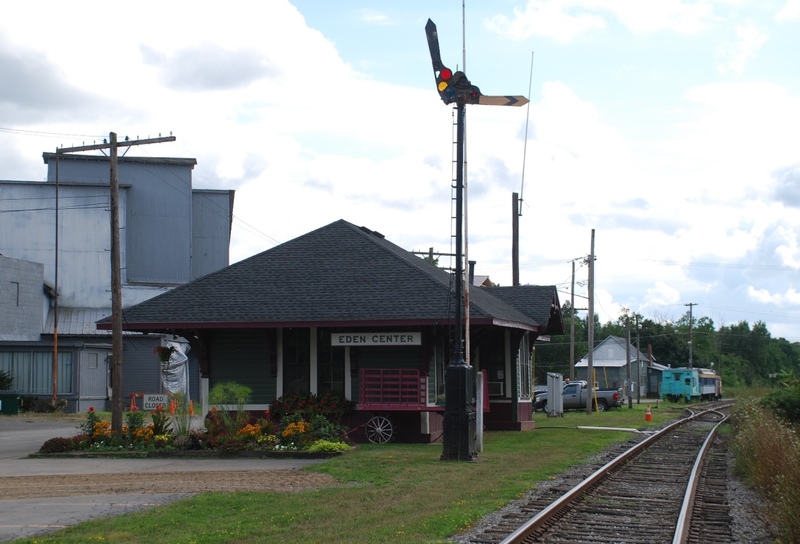 Four people died in grade crossing collisions in Ohio in 2014. Trespassing on railroad property in Ohio accounted for 13 people killed in 2014, a 38 percent drop compared with 21 fatalities in 2013. The safety train will be pulled by NS’ newest commemorative locomotive, the NS 9-1-1, which honors first responders across Norfolk Southern’s 22-state network. The train includes two restored Pullman passenger rail cars with television monitors showing a live video feed from a camera mounted on the lead locomotive. Passengers see firsthand what engineers see from the locomotive cab. The train also includes the Norfolk Southern Exhibit Car, which showcases the benefits of rail freight transportation. Attendees of the Whistle-Stop tour are hearing from Ohio native Mark Kalina Jr., a double-amputee due to a train-pedestrian incident in Columbus in 2012. Invited guests on the train include county and municipal leaders, state and local transportation officials, law enforcement officers, emergency responders, school transportation directors, trucking officials, news media, and others who have a vested interest in public safety. Operation Lifesaver is a national nonprofit safety organization whose mission is to end collisions, deaths, and injuries at highway-rail grade crossings and along railroad rights of way. NORFOLK, Va., July 29, 2015 -- Norfolk Southern brings its Whistle-Stop Safety Train to the Carolinas this week to remind motorists and pedestrians to be safe and alert when around railroad tracks and trains. The train, operated by Norfolk Southern with Operation Lifesaver, www.oli.org, a national rail safety public education organization, is stopping in eight cities on a three-day, 390-mile trip from Charleston, S.C., to Asheville, N.C.
Across the U.S. last year, 267 people died in highway-rail grade crossing incidents, an increase of 16 percent compared with 2013, and deaths due to trespassing on train tracks jumped 22 percent to 526, according to Federal Railroad Administration statistics. In South Carolina, vehicle-train collisions resulted in three fatalities and 22 injuries during 2014, and in North Carolina five people died and 27 were injured. Trespassing on or near railroad tracks resulted in five deaths and eight injuries in South Carolina last year, and in North Carolina 20 people died and 11 were injured. The safety train includes two restored Pullman passenger rail cars with television monitors showing a live video feed from a camera mounted on the lead locomotive. Passengers see firsthand what engineers see every day from the locomotive cab. The train also includes the Norfolk Southern Exhibit Car, which showcases the benefits of rail freight transportation. Invited guests include county and municipal elected leaders, state and local transportation officials, law enforcement officers, emergency responders, school transportation directors, trucking officials, news media, and others who have a vested interest in public safety. South Carolina Highway Patrol officers are shadowing the train as it moves through the state, arresting violators at railroad crossings or walking along tracks. South Carolina Lt. Gov. Henry McMaster and S.C. Sen. John Courson spoke at the rally, as well, thanking NS for bringing the safety train to the state and encouraging residents to use caution whenever crossing railroad tracks. Aboard the safety train, riders are hearing firsthand about the dangers of trespassing on railroad property from Mark Kalina Jr., who survived a 2012 pedestrian-train incident in Ohio and is now a double amputee. “Two years and nine months ago, I made the biggest mistake of my life. To save five minutes, I took a shortcut on the railroad tracks. 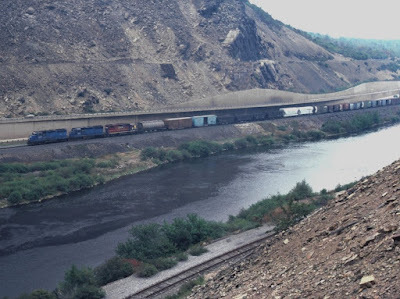 Now I travel the country warning others never to make the same mistake,” said Kalina, who is the spokesperson for the Operation Lifesaver “See Tracks? Think Train!” safety campaign. < · Wednesday, July 29: Columbia-Rock Hill, S.C.-Charlotte-Salisbury, N.C.
< · Thursday, July 30: Salisbury-Hickory-Asheville, N.C.
Norfolk Southern also plans to run a safety train across Ohio Aug. 4-6. The 354-mile trip will start in Cincinnati and make whistle-stops in Dayton, Columbus, Bellevue, Cleveland, and Alliance. All proceeds will go to Tom’s family. Please see our posting below about the NYSME Swap Meet. You know, that’s the place where the Giants and Jets play! See www.ModelEngineers.org under TAB “Shows” for more information. NOTE: You do not have to be a dealer to have a table. Hobbyist, take a table or share with a friend and thin your collection. Many of the tables are fellow hobbyist - This is not your big time commercial type show. Non-profit groups – One FREE table to promote your group. Tickets Now Available For BR&W Christmas Trains!